Dubai, December, 29 2017 - Dubai has been named the World's Greatest New Year's Eve Destination for 2018 by The World Travel Guild. The string of city-wide celebrations occuring across the Emirate this year to ring in 2018 will be unmatched by any other city in the world, says the organization. The festivities will be led by a light show at the Burj Khalifa, the worlds tallest building. Emaar group, the property developers and producers of the show have dubbed the event 'Light Up 2018' and will be looking to set a Guiness World Record with what they have been teasing will be an incredible laser and water show unlike anything ever seen before. Upwards of 1.5 million people are expected to converge on Downtown Dubai to experience 'Light Up 2018' which is free to the public and will be replacing the fireworks extravaganza that took place in front of the iconic Dubai Fountain in previous years. The celebration will he broadcast worldwide. 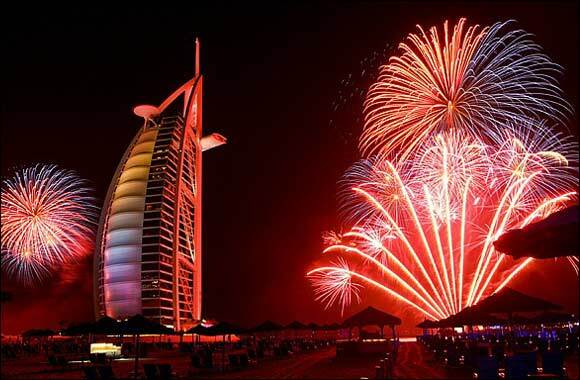 If fireworks are still on your wishlist, however, Dubai will not disappoint. There are numerous displays set to occur across the Emirate from Atlantis Palm Island to Global Village and Dubai Festival City Mall. The Burj Al Arab, the world's only 7 star hotel will have their own impressive firework show which can be seen across the famed Jumeirah Beach and both the Jumeirah Madinat and JBR Walk will have massive celebrations with views of the fireworks from across the Arabian Gulf. Many revelers will take part in a slew of party's that stretch Dubai's famous beachfronts from Palm Island to Jumeirah with countless hotels, restaurants and beach clubs offering experiences that rival those in every other major city across the world this year. Neighboring Emirate, Abu Dhabi, just a short 40 minute drive from the center of Dubai will also be looking to set their own Guiness World Record with a stunnning firework display of their own. All told, the festivities will reportedly cost sponsors in excess of 45 million US dollars to produce. International DJ's and pop stars such as Katy Perry, Akon, Ian Erix, Hardwell, Fatman Scoop and Sigma will be on hand to help ring in the celebrations across the UAE. Erix, who's song 'Footprints In The Sand' has been named the offical theme for NYE '18 will be appearing at several events throughout the week as a celebrity ambassador for the World Travel Guild to certify the festivities and announce the Red Diamond Award. Dubai wins the coveted Red Diamond over other famous and iconic celebrations that take place annually in The United States, Australia, Europe, Asia and South America. The World Travel Guild works in accordance with recommendations from the globes top-tier tourism editors at National Geographic, Luxe Travel, Conde Nast, World Travel Awards and Fodors. World Travel Guild Awards are recognized as one of the most prestigious accolades for cities, brands and special events that offer unique experiences and celebrate diversity. The Red Diamond Award is an honor bestowed upon a small group of recipients who meet and surpass the highest distinctions of excellency in international tourism.